Poker superstar Phil Hellmuth Jr. won his record-setting 12th World Series of Poker individual event championship bracelet early Monday morning at the Rio, further separating the self-described “poker brat” from his two closest rivals. Hellmuth topped a field of 309 players to win the $2,500 buy-in Seven Card Razz event to earn the gold bracelet and $182,793. Hellmuth’s 12th individual event championship bracelet puts him two ahead of Doyle Brunson and Johnny Chan, who each have 10 bracelets. The late Johnny Moss earned nine bracelets in his World Series of Poker career, while two other players, Eric Siedel and Phil Ivey, each own eight bracelets. Ironically, Ivey came within one place of earning his ninth bracelet Monday morning, finishing second in the $10,000 buy-in Pot Limit Hold’em event. Just 103 players remain as the field in the Main Event takes their dinner break, returning with the blinds at 15k/30k/4k. The plan is to play another two levels or down to 81 players, whichever comes first. Full results so far here, chip counts and other updates at wsop.com. Full results so far can be found here and follow the updates over at wsop.com. In what some consider a controversial decision, tournament director Jack Effel decided to stop play with 1:15:44 left in level 16 (2,500/5,000 w/ 500 ante) to have the 751 players remaining (747 make the money) take their 90-minute dinner break. Effel’s explanation was that they needed time to prepare for paying the players who bust out immediately after the bubble bursts. The field had planned to start hand-for-hand play before the announcement. The current leader is Theo Jorgensen with 1,325,000 in chips. Other notables: Matt Affleck (1.26m), Tony Dunst (1.18m), Phil Galfond (1.05m), Adam Levy (840k), Johnny Chan (785k), Jean-Robert Bellande (753k), David Benyamine (630k), Scotty Nguyen (540k) and Eric Baldwin (500k). Also in the field are all 4 Mizrachi brothers: Robert 310k, Michael 118.5k, Donny 115k and Eric 60k. Gavin Smith and Jason Somerville discuss the decision with Wicked Chops Poker. Notables who were eliminated earlier today: Matt Savage, Annie Duke, JJ Liu, Hank Azaria, Robert Varkonyi, Dan Harrington, Erica Schoenberg and Barry Greenstein. Team Pokerati’s only remaining hope (? ), The Big Randy, was eliminated in early action. Follow the action on the money bubble with play resuming at 8:30pm at wsop.com. Daniel Negreanu, Joe Cada, Vanessa Rousso, David Sklansky, Dan Heimiller, Maria Ho, Lacey Jones, Chris Moneymaker, Erik Seidel, Kara Scott, Jennifer Leigh, David Williams, Gabe Kaplan and Capt. Tom Franklin. The reported leader is Sweden’s Paul Kristoffersson with 617,600 in chips. Notables with healthy stacks include Robert Mizrachi (420,000), Scott Clements (415,000), Johnny Chan (400,000), Eric Baldwin (380,000), Jean-Robert Bellande (315,000), Kido Pham (292,000), Phil Galfond (280,000), Barry Shulman (260,000), Robert Varkonyi (220,000) and Vince Van Patten (187,000). More chip counts and updates can be found at wsop.com. UPDATE: For an updated version of the day 2b table draw, click here. The updated table draw only affects those who had another person in their seat. Day 2a of the Main Event saw the return of over 2,400 players filling the Amazon and Pavilion rooms at the Rio in Las Vegas, with the field playing four full levels. As can be expected during the Main Event, the eliminations happened at an accelerated pace. Among the notables who won’t return to the Rio with chips on Monday: Mike Sexton, John Hennigan, Tiffany Michelle, Antonio Esfandiari, Eli Elezra, Liz Lieu, Dennis Phillips, Greg Mueller, Sara Underwood, Dutch Boyd, Daniel Alaei, Ted Forrest, Carlos Mortensen and “Miami John” Cernuto, who didn’t return Friday afternoon due to illness and was blinded off. With play concluding halfway through level nine, a field of 1,200 will enjoy their weekend before returning to join the day 2b survivors as the field will be in the same tournament area for the first time on day 3 at 12pm Monday. The day 2a leader is Boulos Estafanous of Darien, Florida with 340,100 in chips. Other notables with a healthy chip stack include Johnny Chan (281,600), Tony Korfman (275,100), Patrik Antonius (258,600), Sammy Farha (226,500), Annie Duke (176,600), Padraig Parkinson (153,100), Joe Cada (122,400), Chris Moneymaker (104,000), Kathy Liebert (87,000), Scotty Nguyen (67,800), and Matt Savage (54,400). The full list of chip counts can be found at wsop.com, a partial table draw will also be linked here and on my Twitter account. Saturday at 12pm, over 2,700 players make their way to the Rio for day 2b of the Main Event with half the field expected to be out the door by the time play concludes. Follow the action over at WSOP.com. Matt Savage takes advantage of his days off to hold a press conference at 11am at the Bellagio regarding the upcoming season of the WPT. The press conference will also be streamed over the Internet at Ustream.TV here. The first US event of WPT Season IX is the Bellagio Cup VI Main Event, starting Sunday. NOTE: Over 2,100 players have registered for day 1d, with a capacity field of over 3,700 expected. Day 1c of the Main Event drew the biggest field as 2,314 players as defending champion Joe Cada handled the “shuffle up and deal” to get today’s activities underway. Cada finished the day with a respectable 55,000 in chips. Among the notables who don’t get to return for day 2b on Saturday: Tom Dwan, Howard Lederer, Huck Seed, Isabelle Mercier, Chad Brown, Men Nguyen, Faraz Jaka, Dario Minieri, Chau Giang, 2009 November Niner Steve Begleiter, and after making his usual dramatic entrance, Phil Hellmuth exited quietly. At the end of 9 hours of play, 1,642 players will join the 762 day 1a survivors Friday afternoon at 12pm at the start of day 2a. The reported leader at this time is Mathiu Sauriol with 169,900 in chips. Johnny Chan finished the day 2nd in chips with 163,700, other notables back for day 2a include Lauren Kling (149,650), Barny Boatman (144,050), Hoyt Corkins (129,150), David Williams (112,225), Todd Terry (96,175), Jennifer “Jennicide” Leigh (85,425), Brock Parker (71,125), Liz Lieu (70,050), Annie Duke (62,000), Yevgeniy Timoshenko (48,150), and Antonio Esfandiari (44,150). The full list of chip counts is now available at wsop.com. The full table draw for day 2a will be linked here and at my Twitter for those interested when it becomes available. Day 1d of the Main Event gets underway at 12pm, with football Hall of Famer Emmitt Smith handling the “shuffle up and deal” duties, with some poker site sure to put a patch on him if he decides to play. The Main Event field is already the second-largest in history with over 7,000 players registered with a chance it breaks 8,000 over the next 8 hours. Catch the action over at wsop.com, Pauly’s blog and Twitter to see if anyone gets shut out, who gets knocked out, and how this afternoon’s action is played out. Lady Gaga to Play APT Macau? 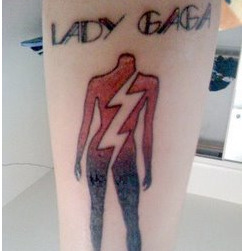 Lady Gaga has a new tattoo. WTF — no spade, heart, club, or diamond? Not exactly … but like Michael Phelps, she did get a special invite — as the pop singer will be playing a show at the Galaxy StarWorld Casino at the same time. Personally, I’m gettin’ a little tired of being bluffed by muffins, but that’s neither here nor there when you’ve got a chance to make a cameo appearance in Johnny Chan’s forthcoming Chinese-language “Poker King” movie, right? “I wanna hold them like they do in texas please, fold’em let em hit me raise it baby stay with me.” We certainly hope so and cannot believe the coincidence that you are playing live in Macau on Saturday 15th August while the Asian Poker Tour Macau Festival is in full swing at the Galaxy Starworld. Your ‘Fame Ball’ Tour has been a huge hit and we are sure the plaudits in Macau will be the same as in Osaka, Tokyo, Seoul and Manila but imagine the reaction if you showed your poker face at the Asian Poker Tour Macau Festival! Not only will the venue be full of the world’s best poker players, the tournament is also the backdrop to the first ever Chinese language poker movie ‘Poker King,’ which people would go ‘gaga’ for if you took on a cameo role. Forget the wigs, keep the bleached blonde hair and think about the exposure to a huge audience! The day 2a field has returned from dinner break with less than 900 players remaining from the starting field of 1,476. Notable eliminations include: Gus Hansen, Johnny Chan, Mike Caro, Tony G, Jennifer Tilly, Shaun Deeb, Todd Brunson, Barry Greenstein and Mel Judah. The current chip leader is Samer Rahman with 325,000 in chips. Other notables: Greg Mueller (223,000), Andy Black (164,000), Tom Schneider (140,000), Vitaly Lunkin (120,500), Jimmy Fricke (105,000), Joe Sebok (94,000), Sam Farha (70,000) and Amarillo Slim (48,000). More chip counts and updates can be found at www.wsop.com here. As a few people have noticed, the water in the Amazon room has changed. No longer is it All In … Johnny Chan’s “energy water” … it’s just the generic Rio bottled stuff. Clearly something has gone awry between All In and the WSOP. 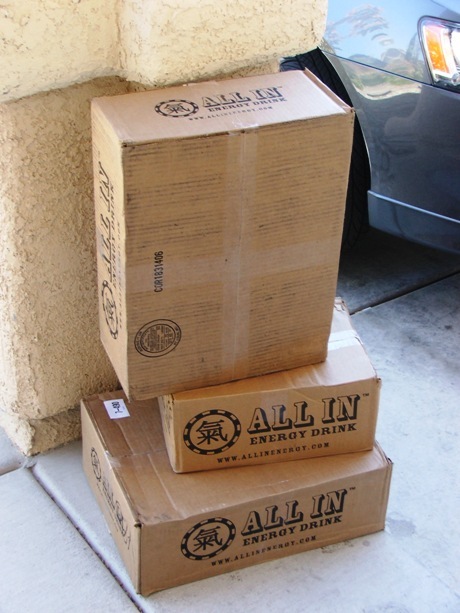 Back in November, the excited word was that All In would be the official energy drink for at least two years. But then, much to our surprise, we saw Red Bull being served this summer, and no All In banners … just All In water. Not everyone is as happy about the World Series as Harrah’s Entertainment, which bought the series in 2004. One of poker’s legendary players and a two-time main event winner lashed out at how the gaming company has run the event and treats the players. The company also has cut back on its comps to players, Chan said. Harrah’s gave him only a $100 food coupon when he entered the $50,000 buy-in H.O.R.S.E. event last week, he said. Chan has not been much of a presence this year at the WSOP. He has shown up for a few big events (4? ), but hardly sticks around once he busts. In fact, he sneaks out a back door, whereas last year he was constantly in the hallways at his company booth, or in the VIP lounge, which was also heavily labeled with All In signage. And that was before he became a supposedly official sponsor. Might someone have made a deal and forgotten to pay the water bill? Johnny Chan lost to Jamin Stokes in the quarterfinal round of the $10,000 NL Holdem Heads-Up World Championship. Currently, the semifinals are ongoing with Stokes playing Leo Wolpert and John Duthie taking on Nathan Doudney. Rico Ramirez is the current chip leader with 6 players left in the $1,500 NL holdem donkament. Mike Eise, Jason Potter, Zack Fritz, Jeff Chang and Barry Berger round out the sextet. Chad Layne, JC Tran and Steve Sung are the top 3 players with 19 remaining in the $2,500 Pot-Limit Omaha event as they play down to a final table tonight. Phil Ivey scraped his way into the money, finishing in 44th. Rodney Pardey is the current chip leader in the $1,500 HORSE event with 87 players remaining, 72 of which will be paid. The chances of them getting to their final table appear extremely remote unless the money gets reached shortly. The $2,000 NL Holdem event has 600 players remaining from a starting field of 1,534. The $10,000 Limit Holdem World Championship started with a field of 185, 182 of which remain. Apologies for the briefness of the update, check out www.wsop.com for further updates. Joe Simmons starts day 3 of the $1,500 NL Holdem event as the chip leader (1,100,000) with 27 players playing down to a winner. You can take a look at who else is left at this link. J.C. Tran (176,900) is the chip leader at the start of Day 2 of the $2,500 Pot-Limit Omaha event, with 61 players remaining, only 45 get paid. Chad Layne (106,000), John Juanda (85,300), Ross Boatman (75,000) and Phil Ivey (56,600) are among the notables who return at 2pm today. Sabic Sebastien leads the field of 220 who return at 2pm today of the $1,500 HORSE event with 72,700 in chips. Marco Traniello (55,000) Andy Black (54,300), Jean Gaspard, (40,300), Ming Lee (32,500) Fabrice Soulier (32,200), and Vanessa Rousso (30,900) make up some of the notables returning to the baize. The noon tournament today is the $2,000 NL Holdem event which was won last year by Blair Hinkle in a field of 1,344 for just over $500,000. The 5pm tournament is another World Championship event, this time it’s $10,000 Limit Holdem, which was won last year by Rob Hollink in a field of 218 for almost $500,000. The WSOP Staff Guide projects 1,344 for the $2,000 NL event (take the under for 1,275), while the $10,000 Limit Holdem event is projected for 229 (take the slightly under for 210). Check back at Pokerati frequently for more updates during the day. Roland de Wolfe became the second player (after Gavin Griffin) to win poker’s Triple Crown (Winning a WSOP bracelet, WPT main event and EPT main event) with his triumph in the $5,000 PLO 8 or Better event, defeating Brett Richey in heads-up play. Dual Omaha bracelet winner Scott Clemens finished in 3rd. Sweden’sTomas Alenius defeated Jason Tam heads-up in the $1,500 Limit Holdem event. Day 3 chip leader Al “Sugar Bear” Barbieri finished 3rd. Fortunately for the WSOP staff, they have Sweden’s national anthem already downloaded. Round 5 of the $10,000 NL Holdem Heads Up World Championship is down to its final 16 competitors, with one more round of play before the winners return on Monday. Among the survivors: Jason Mercier, Mike Caro, Leo Wolpert, Roberto Romanello, Bryan Pellegrino, Yevgeniy Timoshenko, Dustin “Neverwin” Woolf, Johnny Chan and WSOP runner-up in 2008, Alec Torelli. A larger than expected field of 436 started the $2,500 Pot Limit Omaha event, with 153 returning after the dinner break. The unofficial chip leader is Jesse Rios, with another four levels of play to finish the day. The $1,500 HORSE event started about three hours ago and a field of 770 left the starting gate. No established chip leaders at this time, but they have eight levels of play to leader going into the first turn. Check out www.wsop.com and give Pokerati a visit during the rest of your Sunday evening/early Monday morning. Thang Luu (pronounced “Tang”) just took down the $1,500 Omaha Hi-Lo … and while normally an Asian dude winning a smallish mixed game bracelet would hardly merit more than polite applause, this win is truly impressive because Luu won the same event in 2008, and took second place in its nearest equivalent — $2,000 OHL — in 2007. 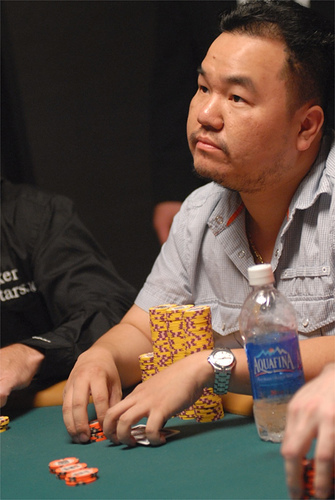 The last player to do something similar — booking back-to-back same-event bracelets — was Johnny Chan, who won the WSOP main event in 1987 and 1988 … and then took 2nd place in 1989. NOTE: Be sure to read the comments for the “more complete” list of back-to-back champions.